If you’re about my age, I know you know it. 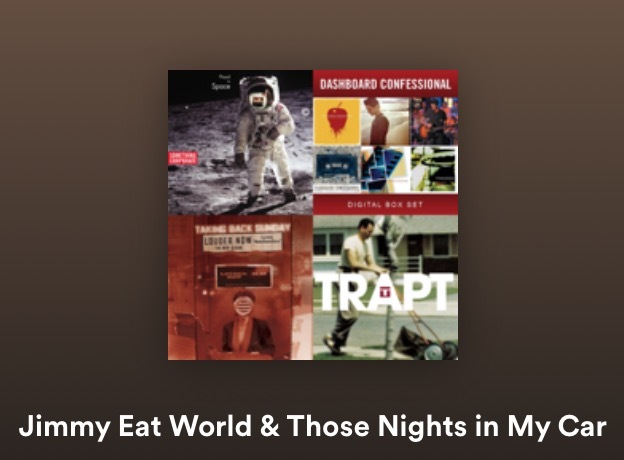 The early 2000s was a perfect time to start college if you, like me, wanted the experience to feel dramatic and terrible and fraught and SO MEANINGFUL. 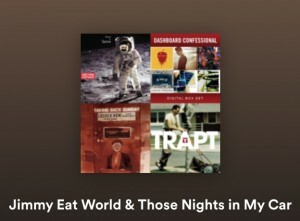 Dashboard Confessional was huge that year. I don’t know if I learned how to feel about love from cute boys singing sad songs, or if they just reflected what I was beginning to learn on my own. I broke up with my first boyfriend right in step with the high school relationship cliche, just before Thanksgiving. I made out several times with a boy who played guitar and wanted me to write him lyrics. And it meant more to me than it meant to him. I believed in being friends with guys I was attracted to and pretending it was platonic but hoping it wouldn’t always be. I made mix CDs all the time, and the same songs were on all of them. When I hear the opening notes of “Konstantine,” I think of the boy I thought I would marry. The summer we started dating, I was living at my dad’s house, he at his parents’ not far away. He would call at night, and one of those summer nights, he played the song and told me, “This song makes me think of you.” I listened in the dark, the receiver hot on my ear, trying not to breathe too loudly for all nine and a half minutes of it, all the while, thinking, God, this boy is so complicated and tragic and vulnerable. I started to listen to it every night when I went to sleep. I didn’t marry him. I also don’t listen to sad songs eighteen hours a day anymore, though I have a good Rainy Day playlist. I don’t know where the image of walking through the student center and hearing that song came from, but it sent me down a rabbit hole of nostalgia. This playlist is the result. And for about three hours last night, I remembered something IN MY SKIN. Aching, beautiful desire. Possibility. How a boy’s brown eyes across a room could lock with mine, and it could mean everything, and no one else even saw it. But let me say this: perspective is everything. Love isn’t SUPPOSED to be tragic. Feeling messy in college and loving messy boys felt exciting because it was terrifying, not because it was True Love. What used to feel aching and beautiful, I now know, is the prelude to a low-grade panic episode. No thanks. “They’ll never hurt you like I do.” How did I miss that line from the song that made him think of me? It might as well have been a promise. Nothing tragic-romantic about it. A lot of the songs are like that, with up tempos, playful melodies, energetic guitars, and biting or maudlin or desperate lyrics. They are a perfect example of the intense contradictions of growing up. I laugh, a little, at their earnestness and abandon now.